Editor Hall Returns from trip abroad Mason City, IA (AP) - W. Earl Hall, managing editor of the Mason City Globe-Gazette, was back at his desk Monday after a two-month trip which took him to England, Scotland, Ireland and France as a guest of the British ministry of information. His return trip was delayed almost a week by strong headwinds over the Atlantic. The Trans-Atlantic plane had arrived at a point within 20 miles of mid-ocean when it turned back because of shrinking fuel supply. 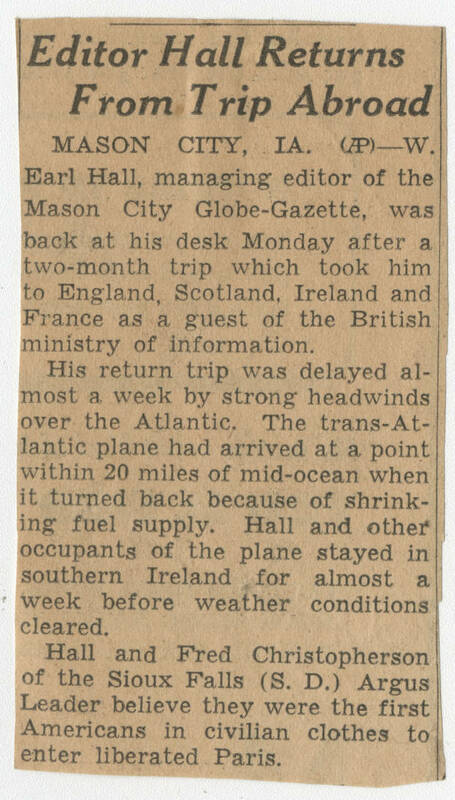 Hall and other occupants of the plane stayed in southern Ireland for almost a week before weather conditions cleared. Hall and Fred Chistopherson of the Sioux Falls (S.D.) Argus Leader believe they were the first Americans in civilian clothes to enter liberated Paris.